This been very popular around bloggers when it have launched, at first I though it's nothing special, but when I saw it on offer I decided to give it a go. During winter time my legs get dry, and so does my elbows, so I need something what would be very moisturising. 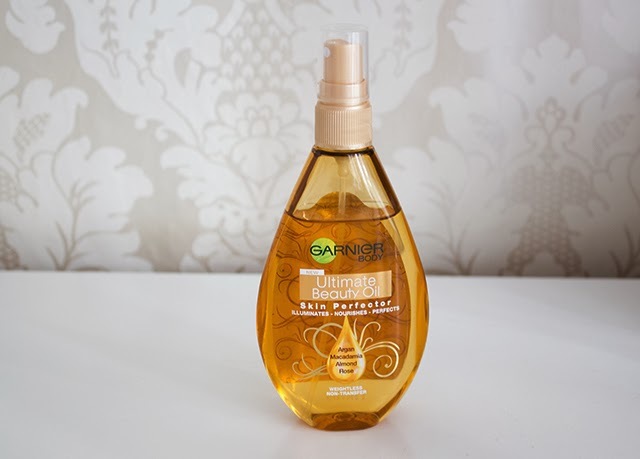 Garnier Body Ultimate Beauty Oil is a fast absorbing oil. I really like the idea it's a spray, as it's a lot easier to apply, although when you have oily hands it gets difficult to spray. The Oil smells amazing in the bottle, but whenever I apply it before going to bed, the next morning, the smell is very unpleasant and you can smell it on you bedsheets as well. You just need to take another shower to wash it off, although there may be people who may like the scent. I am really tempted to try out the rose version. The moisture is great and my legs are well moisturised, on areas where your skin is pretty normal, it may take a longer while to absorb. Overall Body Oils are very popular, but there are mostly high end brands oils, this is great budget buy. I haven't really tried any high end oils, but there are few on my wishlist. The packaging looks lovely. As I have mention I just don't really like the scent, but overall it's a lovely product. This does sound quite nice :) I haven't used a body oil in such a long time, I'd be tempted to give one a go soon. I was really tempted by this budget body oil until you mentioned the smell issue - that's definitely a dealbreaker for me!